Claudia creates whimsical paintings inspired by the recipes and stories! So - each month you enjoy a colorful painting and have a new recipe to try! Recipes and art are timeless in these collectable calendars. You'll love having a new piece of art hanging in your home each month! a sample calendar month - this is how you'll see it in your home. Lots of space to write down appointments, meetings, vacations etc! See below for information about each painting and what inspired it. Paintings and information about each of the recipes - listed in the order they were painted. You can see how the calendar "grew!" ​Fiesta Chick - the final painting for 2017 Cooking with Friends art and food calendar! Thanks to Debbie Farnam for sharing her Spicy Chicken Wing recipe. Her company Deb's Gourmet Pantry makes spicy jellies and jams, and she uses her Hot Pepper Jelly - you can substitute any Raspberry Pepper Jelly. ​Pesto Artichoke Dip​ - This super tasty and easy (yes!) appetizer is featured in September - perfect time for football parties. Thanks Anita Starke for your recipe and for inspiring this fall-colored artichoke painting! Mexican Slaw - Cooking with Friends food and art calendar is a 13 month layout and this recipe is featured in January 2018. Claudia created this slaw using some of her favorite ingredients, especially cilantro and a lime vinaigrette. It's super easy, good to make for a crowd and holds up well for parties. These funky Mexican Flowers capture the spirit of the spicy slaw! Muffuletta a la New Orleans. Nancy and Sam Potter shared a recipe for these classic New Orleans sandwiches. This time, one of my paintings (one of their favorites) reminded them of a time they had Muffulettas on a picnic when visiting that city in the fall. She lost a shoe there (that's gotta be a good story!) and found the shoe 2 days later! Fun memories - and great recipe. Divine Miss Daisy. Deanna Heikkinen shared her Mom's famous recipe for beef enchiladas, Even her Mexican friends asked for this recipe! You can make it for Cinco de Mayo and enjoy this painting in your kitchen all through May. Miss Beanie! Susan Ballard is an early childhood friend from Bishop, Tx. She shared her friend Beanie's dip at our last elementary school "girlfriend reunion" and I LOVED it - especially with Fritos. Who knew bean dip could be so good - especially shared with special friends. Robin Pollock and her friends enjoy this healthy and tasty salad while cruising the river in Austin, Tx on their funky party boat. This is so perfect for "Weird Austin" - funky boat, healthy food, and hanging out with your friends on a lazy summer cruise on the river! Kay and Brian Pitts have this thing for pink plastic flamingos - and eggnog! They have a mean eggnog recipe, with booze of course! That's part of their fun story. When I showed them this painting, Kay asked where the eggnog was. I said the flamingo drank it - see the smile? Lori Kueker makes this family favorite dish using blueberries from a bush that her Dad planted. How special is that! This is a dessert perfect for a 4th of July picnic when blueberries are in season. Shanna Cox shared her mom Sandy's recipe for this delicious summer dessert. Think tropical fruit layered with orange-soaked cake, pudding and whipped cream - and drool! It's the perfect treat on those hot summer days that Sandy loved so much. These joggers are headed to Patty and Peter Wonderly's home for Patty's tasty and nutritious crustless quiche! This is good enough to make me a jogger. Well . . .
Johanna Moon Goldberg shared her Mom's recipe for New York Cheesecake. This makes my husband very happy - he LOVES cheesecake! Johanna's family would count down to the new year so they could enjoy this yummy traditional holiday dessert. 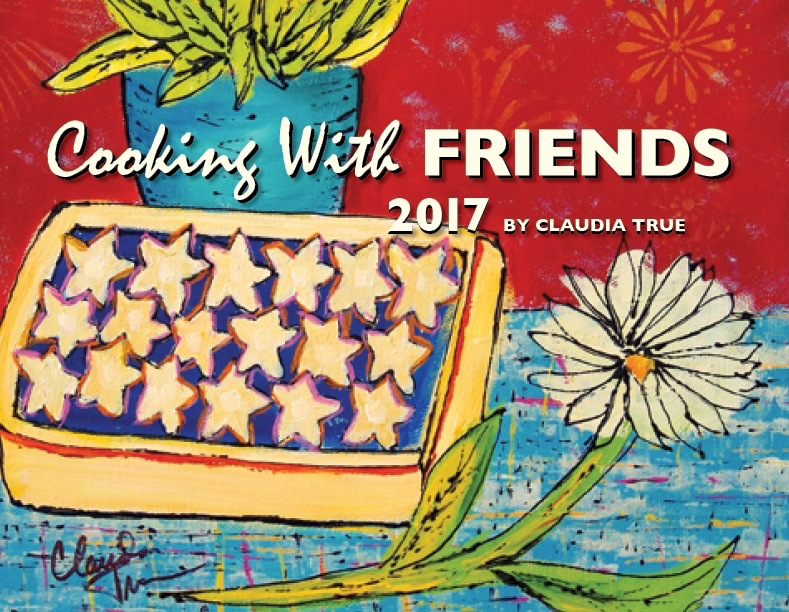 Yay - my first painting is done for the 9th annual Cooking with Friends calendar. Recipe shared by Tom Xavier - it was one of the first that his Mom taught him to make. She did something right - Tom's a great cook! Perfect appetizers with a little sausage and spices.